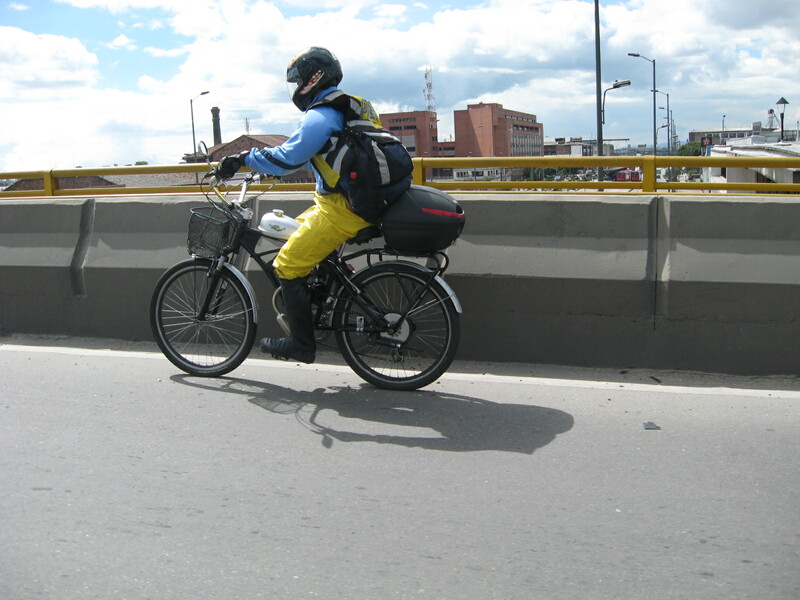 As I traveled to Colombia in July of this year I started noticing that many of the bicycles sharing the road with the automobiles were going to fast for a bicycle; yet the bicyclist didn't seem to be pedaling with much effort. It's then when I noticed a little something that looked like a motor. Sure enough... many of those are now equiped with a small gas-powered motor that assists the crank. There are so many electric and motor bicycles now on the roads of Colombia and every other country that I am starting to hear of new regulations for those on bike trails. A motor-assisted bicycle can reach speeds of up to 45mph or 72Kmph on a flat road. This is a considerable speed for any person traveling without the protection of a seatbelt, windshield, fenders, etc. In my opinion a bicycle that can reach such speed and shares the same roads with automobiles should be considered a motorcycle and should be regulated accordingly. Not only should it be regulated for the sake of the driver, but for the benefit of pedestrians.